The Democratic Unionist Party leader has said she hopes to seal a deal on supporting Theresa May’s minority government “sooner rather than later”. 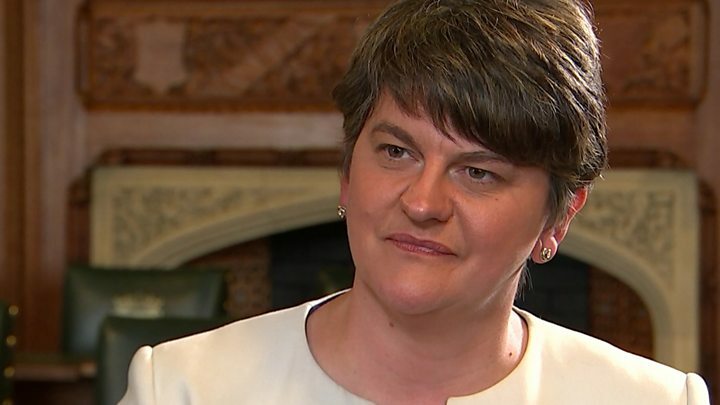 After meeting the prime minister in Downing Street, Arlene Foster said discussions were “going well” and she hoped for a “successful conclusion”. The BBC understands a final meeting to approve the deal is set for Wednesday. But ex-Conservative PM Sir John Major said he was “dubious” about the idea and its impact on the peace process. But Sir John told BBC Radio 4’s World at One that if the party “locked” itself into a deal with one of the main parties in Northern Ireland, there was a danger the government would no longer be seen as an “impartial honest broker” in restoring the power-sharing arrangements and upholding NI institutions. Peace in Northern Ireland should “not be regarded as a given”, said Sir John – whose government laid the foundations for the peace process in the 1990s – and nothing should be done to “exaggerate the differences” between the unionist and nationalist communities. He urged Theresa May to consider governing on her own, saying this would not “carry the baggage” for the Conservatives that an arrangement with the DUP would. 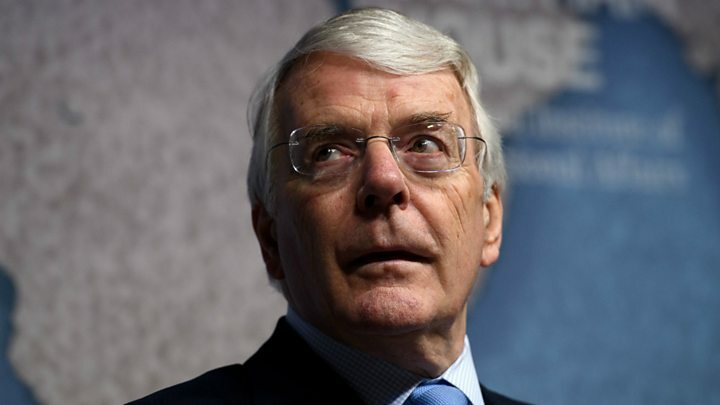 Sir John suggested the DUP would be asking for money and that would be seen as the “government paying cash for votes in Parliament”, and would be received badly in other parts of the UK. 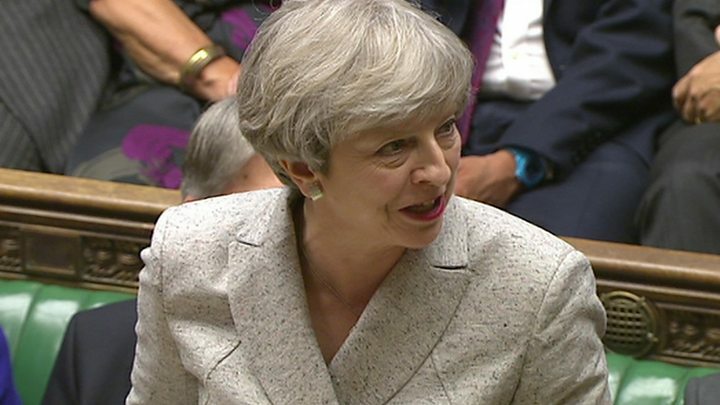 Asked about Sir John’s comments during a trip to Paris, Mrs May said she was “absolutely steadfast” in her support for the 1998 Good Friday Agreement – which created the Northern Ireland Assembly – and efforts to revive the power-sharing executive. Mrs May, who has been holding talks with French President Emmanuel Macron on counter-terrorism and Brexit, said the “productive” talks with the DUP were about “giving stability to the UK government that is necessary at this critical time” ahead of the start of the Brexit process. Reality Check: Has election changed EU views of Brexit? Conservative sources said “constructive” progress had been made in the talks and both sides were “working carefully through the paperwork” to complete the deal. Mrs Foster told the BBC areas being discussed including Brexit, counter-terrorism and “doing what’s right for Northern Ireland in respect of economic matters”. The BBC’s assistant political editor Norman Smith said the DUP was likely to demand money for investment in Northern Ireland and an end to austerity. Sinn Fein, whose seven MPs will not take their seats in Westminster, said any deal must be approved by the Northern Ireland executive when it is back up and running. “Any agreement reached with the DUP – financial or otherwise – cannot be to the detriment of anyone else in our society,” said Belfast West MP Paul Maskey. Who are the DUP’s 10 MPs? What won’t be in the Queen’s Speech? Earlier in the Commons, as MPs gathered for the first time since the election, Jeremy Corbyn congratulated Mrs May on “returning as PM” and said he “looked forward to this Parliament, however short it may be”. 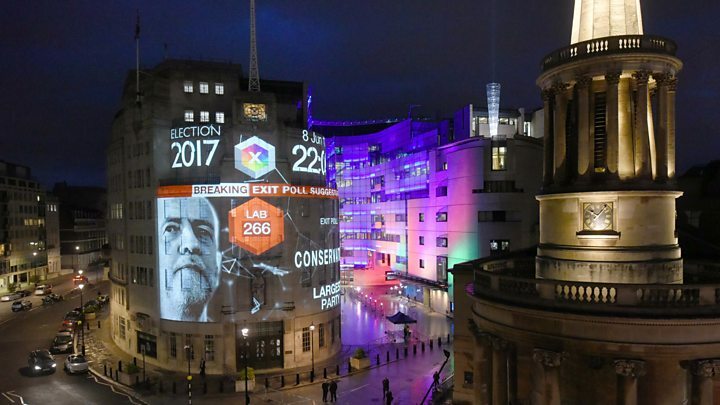 The Labour leader joked that he welcomed the prospect of a Queen’s Speech once this “coalition of chaos has been negotiated”, but said if this did not happen, he was “ready to offer strong and stable leadership in the national interest”. Mrs May has chaired the first meeting of the cabinet since the election and has been finalising her reshuffle, with changes including Steve Baker, a leading backbench Brexiteer, becoming a minister in the Department for Exiting The EU. 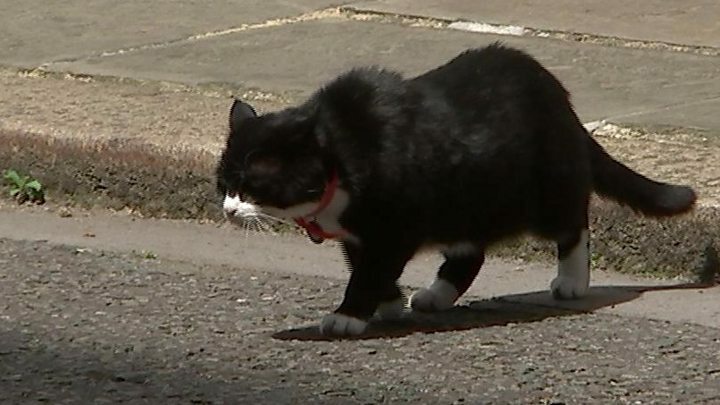 The move was welcomed by Conservative commentators, but the Lib Dems said far from “softening her stance” on Brexit after the inconclusive election result, the PM had put a “fox in charge of guarding the hen house”. 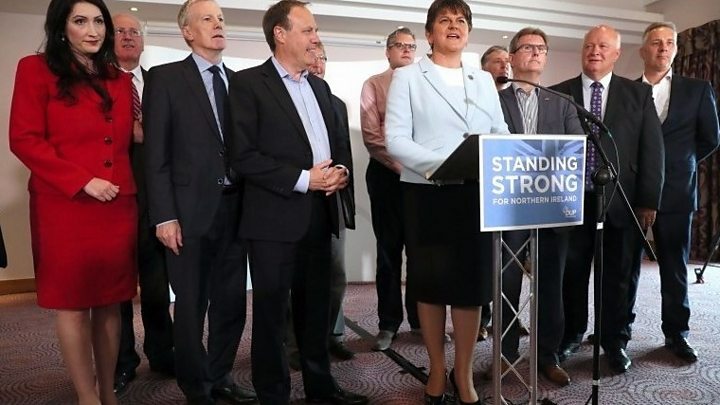 Media captionWho are the DUP? Senior EU figures, meanwhile, have expressed their growing impatience with the UK and warned the clock is ticking for the negotiations, which have only 20 months to run. In a joint press conference with Mr Macron, Mrs May said Brexit talks would get under way next week as planned. Mr Macron told reporters that while respecting the decision of the British people to leave the EU, the door “would always remain open” if they changed their mind. Do you live in Northern Ireland? What are your thoughts on the Conservative and DUP talks? Share them with us by emailing haveyoursay@bbc.co.uk.